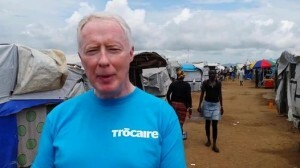 Eamonn Meehan, executive director of Trócaire. The decision by US President Donald Trump to stop funding humanitarian projects in Gaza and the West Bank has been branded “reckless” by Trócaire’s outgoing CEO, Éamonn Meehan. The cuts by the United States administration include US$200m that went to charities providing medical care and humanitarian services in Palestine. Trócaire’s sister organisation in the United States, Catholic Relief Services, says the cuts mean that the number of people in Gaza that it supports with food has dropped from 150,000 to only 200. This particular cut follows a decision by the Trump administration to end its annual US$350 million contribution to the United Nations Relief Works Agency (UNRWA). This is the international body responsible for providing food and other basic supplies to five million Palestinian refugees in Israel’s occupied territories and in Jordan, Syria and Lebanon. The annual US contribution accounted for a quarter of UNRWA’s total budget. While the US is cutting US$550m annual funding to Palestinians, it is continuing to give Israel US$3.8bn every year to spend on its military, said Trócaire’s chief executive, who is due to retire in two months’ time from his post as head of the Irish Church’s overseas aid agency. President Trump is due to visit Ireland in November.